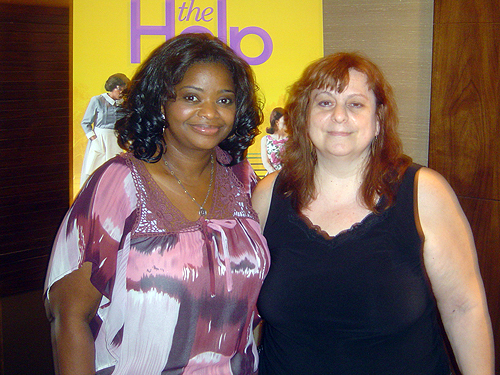 On August 10th the best selling book by Kathryn Stockett “The Help” will be drawing readers and viewers alike when the film version is released, a prospect that delights actress Octavia Spencer, who will be bringing the role of Minnie to life on the screen. The first things you notice about Octavia are her dark, expressive eyes that sparkle with warmth and intelligence as she discusses the movie and her thoughts about playing Minnie. The actress has known the film’s producer, director and writer Tate Taylor and producer Brunson Greene for at least 17 years and the book’s author Kathryn Stockett for quite a while as well. In fact, in many ways Spencer was the role model for Minnie or as she explained she colored in the outline that Kathryn wrote first and then Tate adapted. “She is the best character I’ve ever had the opportunity to play cause she’s so complex, but it was a great group of people too because I think we all played off each other well,” she began. “I met Kathryn as she was formulating the characters. She knew I think the voice that inspired Aibileen was from her childhood caregiver Dimitri and I think she felt she needed a stark contrast to her. Instead of a regal, poised, stoic sage, you know, she opted for a short feisty spitfire and I would love to think that I’m that exciting,” she laughed. One trait that Octavia doesn’t share with Minnie, however, is her character’s talents in the kitchen. She thinks that it was her physicality and part of her attitude that Kathryn latched on to since she describes herself as being very grumpy when she first met Stockett. “It was hot. It was like a hundred and something degrees in New Orleans. It was like the perfect storm. I think it was meant to be as she was formulating those characters,” Spencer, whose film credits include “Seven Pounds”, “The Soloist” and “Big Momma’s House”, remembers. Still the part was not an easy one in some ways. “I think the greatest challenge was the time period and the emotional constraints, you know, socially. I am a product of my generation and definitely of this era that we are in, so it was very difficult to change that mindset and quote unquote not “trust people” who were not Southern Baptist African Americans. That was really a challenge for me because knowing Tate and Brunson, then afterwards Kitty and some of my other friends. They cross so many lines as far as education, race, religion, sexual orientation, I mean an amalgamation of people and that is not the homogeneous environment that Minnie was raised in, so that was very difficult,” she said. The cast and crew enjoyed working together on the shoot, which was a huge plus considering the dramatic material. “There was so much love on the set and it was so supportive. Personally, I was grumpier than I usually am being in Minnie’s mindset. I guess I’m a method actor,” Octavia joked reiterating that despite the challenges there was lots of camaraderie on the set. “We all clicked and then those of us who had scenes together clicked even more, so much so that Viola Davis and I don’t go like two days without talking to each other or just communicating in some form, text, email or phone call and then Jessica Chastain and I are really close,” she went on. Sharing her thoughts about the ladies in the film Octavia said thoughtfully, “Isn’t that the beauty of people and of women. Because so often we have to, I don’t know, silence ourselves or be silent and sort of mask who we are to please people and what I love about Minnie is that she doesn’t. She wears a mask. She wears I’m brave. I speak for myself. She’s very gruff. She wears that mask, but you can tell by the bruises that she is a survivor. Aibileen is a survivor. Her bruises are internal. Celia is a survivor even though we don’t know her full story. She gives us enough of an idea. Skeeter is a survivor, you know, in a strange way, a child who only received that type of love and nurture from her caregivers. There are so many survivors in this story that I think it’s a good piece of material for young women to see, for people who feel like outsiders. Whether gay, straight, whatever hurdle you are personally struggling through or with, I think this movie speaks to that. It’s about courage and summoning that internal voice,” Spencer believes. Despite the serious subject matter the story does offer a number of funny moments adding to its charm. “Lord, isn’t that what life is all about? Can you imagine not being able to laugh?” Octavia asked. “That’s what I love about movies or projects that give you a perfect balance of pathos and humor,” she said adding that no one would want to be out with somebody who is either constantly morose and dramatic or with someone who is always up and trying to be funny. “You just want that balance and that’s what I love about the book and now the film. I think it is perfectly balanced with how we deal with things in life. There are the ugly parts of life and then the beautiful parts. We kind of give you all of that within that two hour period I think,” she finished. 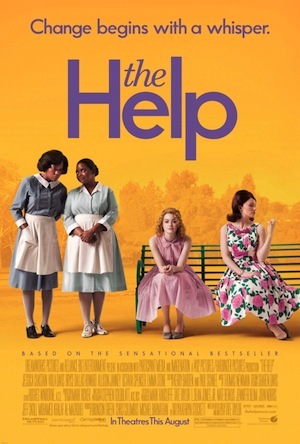 One concern the actress does have is that “The Help” will be referred to as a “chick flick” by some. Rejecting that label she commented, “I think that it’s appropriate for anyone, especially a person who needs to find that heroic spirit within themselves. We all have it and these three women, ordinary women, do something extraordinary. They become the heroes of their own life, so I hope it’s not billed as a chick flick even though there are a lot of hot chicks in it.” She also has another concern. “I also hope people don’t get mired down with the time period for even though it takes place in the civil rights era, it’s not about civil rights. It’s about the relationships that these three unlikely women form,” she emphasized. In fact, some might view the relationships in “The Help” more on a parallel with last year’s Oscar winner “The King’s Speech”, a comparison that would please Octavia a great deal. “I love that about “The King’s Speech” and it just hurt me when the king pulled rank, you know, and Geoffrey Rush’s character didn’t rush back in there. He let him find his way back to him and you know that’s the other thing I love about this film. The relationships evolved in their natural pace and nothing was forced. Minnie came to the party when she was ready to come to the party,” Spencer said. 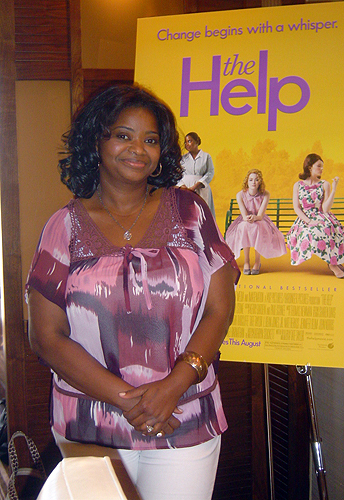 Because of the success of “The Help” she has been able to meet many new people in the entertainment industry, which she’s hoping will bring more opportunities in the future, but she’s also content to be where she is in the present enjoying the relationships she’s cultivated with the cast and crew of this movie. “I feel like Cinderella at the ball. If my coach should turn into a pumpkin I did get to wear those slippers for a minute, so I’m really happy for this moment,” she went on. Although there is early talk about the possibility of an Oscar nomination, as well as consideration for other awards, Octavia is not focusing her attention on that, “Every actor would love for that to happen, but since it’s so out of our hands…right now I’m excited that I get to go to a movie that I was a part of and eat popcorn and at the end of the day be proud of the message that that film is putting forth,” she finished with a big smile on her lips and a wistful look in her eyes.